Children can be overwhelmed and I find it is best to talk about expectations ahead of time. For example, before we went through security I explained what the rules were, what we needed to do and described what I was doing. 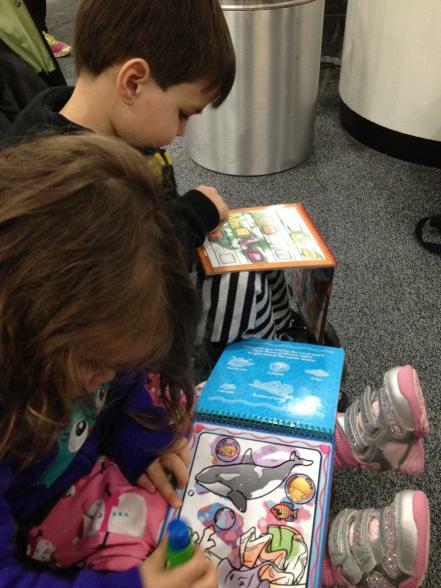 The books above helped accustom them to what would occur at the airport. My children are great at running in opposite directions so in order to survive the two hours at the airport we invested in the Delta Double Umbrella Stroller . I was lucky to test run Jessica’s single stroller (see her review here) and knew Delta put together a compact and light weight stroller so this was exactly what I needed. My children loved sitting next to each other which helped me. Now, here is the exact opposite of the above advice which is let them walk. If we could harness the energy of one toddler it could power an entire city or at least a small village. Children do need to get rid of that energy, so walking is a great strategy. My son helped push the stroller a few times (mostly in the big empty spaces because his steering is questionable). Before I let them walk, I would always speak to them at their eye level, explain the rules and give them a time limit to avoid meltdowns. Children are naturally curious. The wait to board the plain is unnaturally long. Take advantage of this moment to walk or stroll around the airport to talk about all the objects they see and activity that is happening. If I did’t know what something was, I would ask a flight attendant which models for the children how to ask questions. Since we read about airports prior to our trip there was a lot of identification occurring as we waited. Each child had a Tervis water bottle. I kept the bottle empty which made it light to carry and then after we passed security, water was added. Plane rides are dehydrating and so it is good to have water available to keep hydrated. Just be prepared as too much water eventually needs to exit the body and that can be a challenge maneuvering more than one child to the bathroom. I was completely surprised how much my children loved playing with these books. The pen just needs water which we added after passing security with a nearby water fountain. I bought the landscape and alphabet WOW Water books which the kids exchanged regularly. They not only played with this during the plane ride to and from Florida but also throughout the entire vacation. The books are great for developing hand-eye coordination, and the alphabet one is perfect fit for my son who is learning to write his letters. These kept my kids attention for a long time and come in a variety of styles. Each child had a Squishanimal Dinosaur but I think even a tactile toy from the dollar store also gives them some opportunity for sensory play. If you have an existing toy in your arsenal, just keep it hidden several weeks before the trip and let them find it in their backpack. Sensory toys are great for children as they still love to explore through touch. This toy enables children to squeeze and pull to help settle any anxiety. My children had received a LeapPad as a Christmas gift from their grandparents which is a phenomenal educational toy. On our ride back my son spent a lot of time playing with the dragon in Pet Party including a game where he had to find different shapes. I pulled this toy out last as the ultimate reward or distraction toy depending on the situation. Unlike the WOW Water book and Usborne Wipe Clean Books which needed a tool to engage with the books, the LeapPad has everything it needs within the device. These books kept my kids attention throughout the trip. They are easy to use as well as clean. The books are lightweight so it is not a heavy addition to their backpacks, and they are durable. 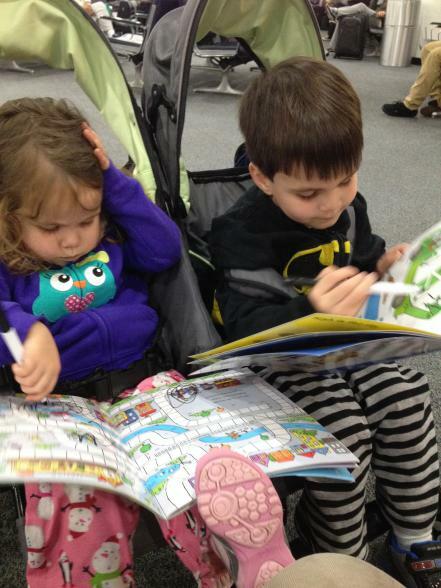 As well, the books made writing and drawing fun for my children as they developed their fine motor skills. My daughter loved The Maze Book as she was finally being allowed to trace using a marker and develop her critical thinking skills. My son has been increasing his number identification skills so we picked up the Dot-to-Dot Wipe Clean Book. If you are nervous about messes then pack hand wipes; however, I have tendency to have those on me at all times anyway. The Usborne Wipe Clean books are fabulous to not only keep your children’s attention but also to sneak in time to improve fine motor skills. Prior to the trip, I was apprehensive dreading the time in the airport but the experience was positive and fun. Part of my strategy was preparing my children and myself as well as ensuring that there was lightweight educational activities to keep us engaged during the wait. 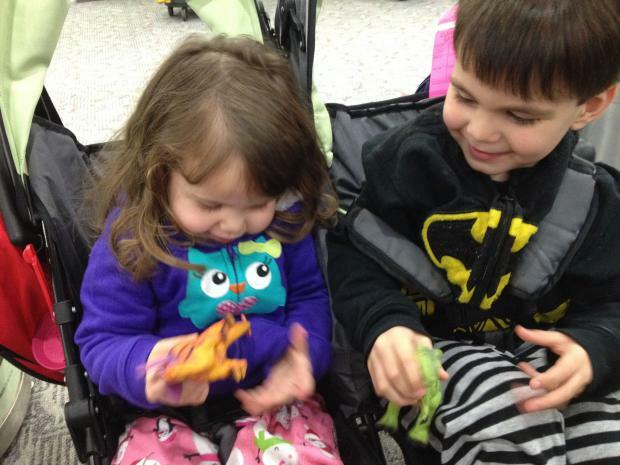 What do you do to keep the kids occupied at the airport? I LOVE THIS POST! I have incorporated many of these but there are some I have not encountered. It is great to see someone else have a positive experience despite the fact that the whole ordeal is challenging and exhausting. Good job mom!